While most people think the Tsunami threat is primarily limited to the Pacific and Indian Ocean, as we've discussed previously (see The Caribbean’s Hidden Tsunami Potential (Revisited), the Caribbean and the Atlantic both have a history of seismic activity. In 1995, Montserrat's previously dormant Soufrière Hills volcano sprang to life, destroying the capital city of Plymouth, and rendering half the island uninhabitable. In 1992, a `rogue wave' - described by witnesses as being between 10 and 18 feet tall - slammed onto a 27 mile stretch of Florida Beaches (including Daytona Beach) and smashed hundreds of cars and caused as many as 75 (mostly minor) injuries. Even though destructive tsunamis are rare - if you live in, work at, or visit any coastal region - you should be aware of the potential threat, and what to do if a tsunami warning is issued. The two biggest tsunamis in recent history are the 2004 Indian Ocean Tsunami, which killed upwards to 250,000 people, and Japan's 2011 Tōhoku Earthquake/Tsunami which killed in excess of 15,000 people. While less deadly, Alaska's 1964 earthquake produced significant tsunami effects both locally, and thousands of miles away, killing 5 in Oregon and 13 in California. 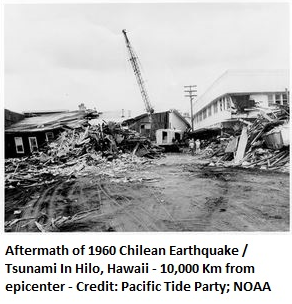 Chile's 1960 Valdivia earthquake sent a train of tsunamis across the Pacific, causing heavy damage and loss of life in Hawaii, Japan, and beyond (see NOAA Report). A reminder that large earthquakes, volcanic eruptions, or tsunamis that occur even thousands of miles away still have the potential to impact people around the globe. In this scenario approximately 750,000 people would need to be evacuated, with 90,000 of those being tourists and visitors. Additionally, one-third of the boats in California's marinas could be damaged or completely sunk, resulting in $700 million in losses. It was concluded that neither of California's nuclear power plants would likely be damaged by this particular event. The study (link) also estimates damage to marinas, businesses and homes range between $3.5 billion and $6 billion, and as many as 8,500 could be left homeless. An even greater threat lurks along the Cascadia Fault line, which runs parallel to the Pacific Northwest Coastline and has a long history of a producing major earthquakes and tsunamis, the last one in the year 1700. The geological record indicates massive quakes have struck the region at least 7 times over the past 3500 years. 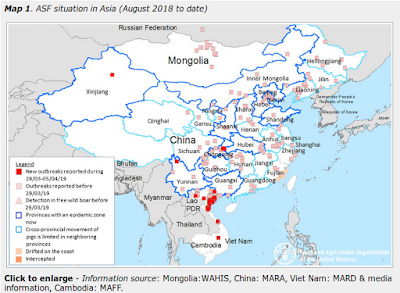 Publicity in the New Yorker Magazine a couple of years ago has raised awareness of this threat and we’ve seen renewed calls for preparedness in the region (see OSU: Pragmatic Action - Not Fatalism - In Order To Survive The `Big One’). We also ooked at the threats posed by this particular fault line back in 2011 in Just A Matter Of Time. 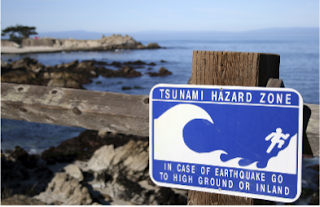 While strong earthquakes are the most common cause of tsunami waves, other causes include submarine landslides, meteo-tsunamis generated by anomalous weather events, and rarest of all – tsunamis caused by asteroid impacts. As far as what to do before a tsunami threatens, READY.GOV has a Tsunami Awareness Page with helpful hints. Between hurricanes, tornadoes, wildfires, earthquakes, blizzards, floods, wildfires, and tsunamis - there really isn't anywhere you can live that isn't susceptible to some type of natural disaster. Which is why everyone - regardless of where they live - needs to have an appropriate disaster plan, just as everyone should have a good first aid kit, a `bug-out bag’, and sufficient emergency supplies to last a bare minimum of 72 hours. While 72 hours is an admirable start, I wouldn't feel terribly comfortable with it. Here in the United States many agencies and organizations recommend that households work towards having a 10-to-14 day supply of food, water, and emergency supplies on hand. When 72 Hours Isn’t Enough.